Powerhouse Receiver - 125 Watts RMS P/C ! Classic Marantz Quality! Looks and sounds like new! This unit has been recently serviced, all switches and pots are clean and lubed, amplifier and tuner electronics have been checked and aligned with warranty. The 2325 is easily worthy of its legendary status. This receiver is a great piece of equipment: according to some Marantz collectors, it is the best receiver ever put out by Marantz during the "monster receiver" era of the "70's. 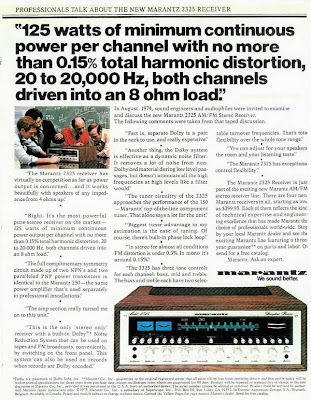 In the 2325, Marantz had taken the hearts from their best power amplifier, their best pre-amplifier and their best tuner and combined them all into one chassis. To this day, is considered by many Marantz collectors as the finest receiver Marantz ever made. 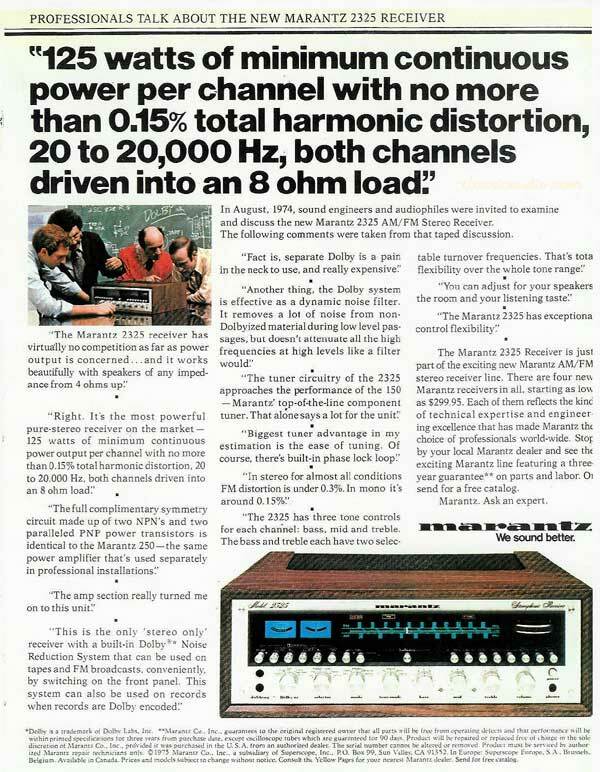 The 2325 established the classic Marantz styling of the 1970's. With all the lights on, it is quite stunning. Sound-wise it can hold its own with virtually anything out there today.